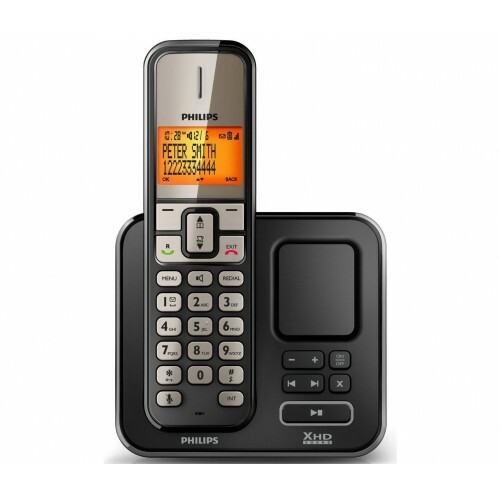 A stylish and reliable cordless phone, the Philips SE275 also features an answer machine providing up to 30 minutes of recording time. Most impressively, this phone offers exceptionally high sound quality thanks to Philip's XHD sound technology, and you can also enjoy the comfort and freedom of hands­-free communication thanks to the high quality speakerphone. The outstanding sound quality will likely be the very first thing that you notice when you use the Philips SE275 for the first time, thanks to the provision of XHD sound technology to provide purer and clearer voices at higher volumes. The speaker even contains a real acoustic chamber, revolutionizing the way you hold your phone conversations. At the press of a button, you can easily take those longer phone calls hands­free. The built­in loudspeaker also provides excellent audio quality, amplifying the voice of the caller without any distortion. With 12 hours of talk time, you won't have to worry about running out of battery during longer calls either. The Philips SE275 features a stylish two­line display illuminated by a mellow amber­coloured LED. Using the screen, you can easily cycle through the your most recent phone calls and manage your contacts list. You can store up to 100 contacts in the phonebook, while the base station can store up to 30 minutes of messages. Why Should You Buy this Cordless Phones? The Philips SE275 is a stylish, affordable and user­friendly phone for home users. Quick and easy for me to set up.